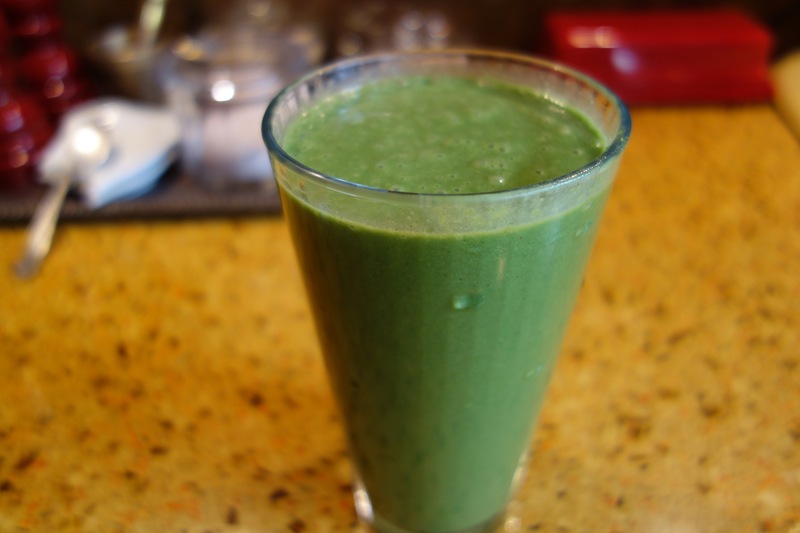 Transfer all the ingredients to a blender and blend until smooth. Consume immediately! Here is another delicious drink recipe courtesy of my dear husband. As I have mentioned before he is a great mixologist and our friends and family are very grateful recipients of his creative talent. He made this drink for the barbecue we were having. I was making the lamb burgers paired with the carrot and potato salads. The delicious drink is made with the usual white rum but in this one citrus white rum is used- it imparts a great lemony flavor. The other important flavor of course is the pomegranate liquor- the star ingredient. The tangy pomegranate flavor goes perfectly well in this delicious drink. It provides the right amount of sweetness. Some ice and lots of fresh mint make this drink perfect. It is ideal for the summer months- especially for the upcoming long weekend. In a drink mixer, add the fresh mint and simple syrup. Muddle the mint with the back of a spatula. Add the pomegranate liquor, rum and limejuice. Shake well and pour into a glass full of ice. Add the club soda on top and serve. I posted this a couple of years ago .. and it is perfect for Cinco de Mayo!! Did I mention I was obsessed with Latin cuisine? Well, I guess it is easy to see if you browse through my recent recipes on the blog. Every time I try to come up with a new recipe or something different for dinner, the only thing that comes to mind are Latin flavors. The other thing I am loving right now are passion fruits. This Brazilian native fruit is the best tasting fruit ever! It is by far the most flavorful thing I have ever tasted. I wait for them to show up at Whole Foods or Eden Gourmet. They are quite expensive but SO worth the taste. Place the sliced fruits into a large glass pitcher. Add the wine, lemonade, orange and passion fruit juice in the pitcher. Let the liquid sit in the pitcher in the fridge for a couple of hours before serving. This drink is courtesy of my dearest husband who is a great mixologist. Whenever we have people over, I cook and he makes fabulous drinks- it is a great combination. He loves coming up with different, delicious concoctions. Recently some friends went to Mexico city and got us a very nice tequila. My husband was super happy to get a great quality tequila and couldn’t wait to give it a test run. 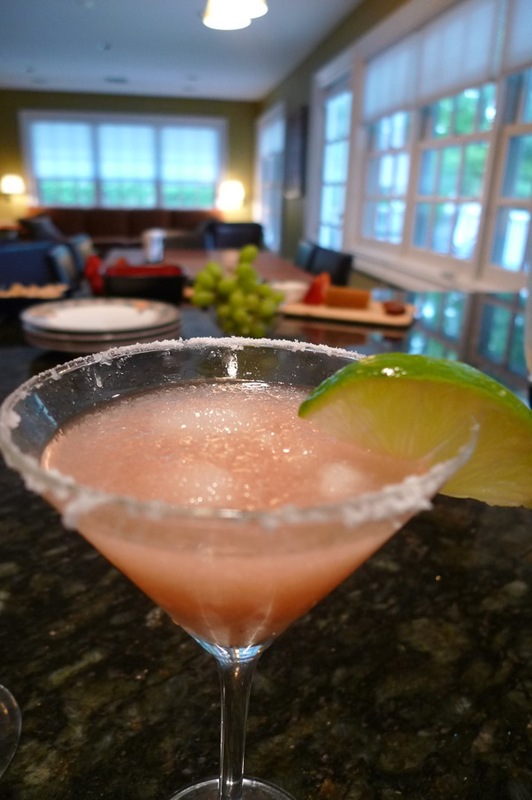 The same friends invited us over for a cook out and my hubby decided to make a pomegranate margarita concoction and take it to their house to serve right before dinner. The pomegranate margaritas were delicious- perfectly mixed with the right amount of alcohol, lime juice and sweetness. This drink will be ideal to serve for Memorial Day. Add the pomegranate liquor, tequila, triple sec, limejuice, simple syrup and ice in a shaker. Shake well. In the meantime, cover the glass rim with limejuice from the half lime. Dip the glass rim in the salt and pour the drink and serve. If you want the drink frozen and blended- add all the ingredients into a blender including the ice. Blend till smooth and pour into a salted glass. A close friend from college is taking a hiatus from work and so I have been spending a lot of time with her. She and I are both into food so we try out lots of restaurants in the area or go to our favorites. We have been meeting for lunch almost daily if not a few times a week. Our favorite places are mostly in Edison- the Indian area- we tend to eat the street foods we miss so much that tend to assault the palette- spicy, sweet and savory, all at once. Recently we went to an Ethiopian restaurant in the area and had a fabulous lunch! We ordered some vegetables and a spicy salmon dish- it was really good. It was a warm day and we saw something called spice tea on the menu- served hot or cold. The person taking our order recommended the cold version. I was a little skeptical especially because I make the hot version at home all the time! Well, I was pleasantly surprised! It was absolutely delicious- very refreshing indeed. It was sweet yet extremely flavorful- the aroma of cinnamon came through very clear without being overpowering. I asked the gentlemen for the recipe and he gave it to us- well he gave us the ingredients. I decided to replicate the drink and serve as a refreshment for the cooking class I had a few days ago. I think I was able to duplicate the flavor successfully. 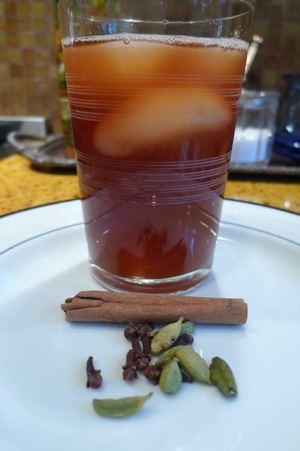 I foresee enjoying the spice tea this summer- well, when I am not indulging in the sangria!!! In a small saucepan bring the water, cinnamon stick, cloves and cardamom pods to a boil. Add the tea bags and steep for a minute. Take the bags out and turn the heat off. Let the spices steep in the tea for an hour. Strain the liquid and pour into pitcher. Add the honey and mix till dissolved. Add ice and refrigerate for at least an hour before serving. What is your favorite coffee contraption?? This topic is very near and dear to my heart. My morning cup of coffee is something I think of all day- before I have it and also long after I have savored it. 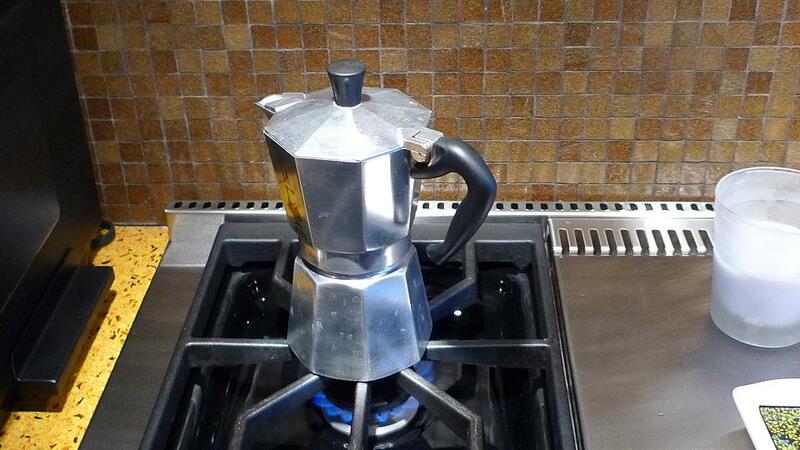 I use a stove top espresso maker which I discovered in Europe. I was visiting my aunt and discovered she didn’t have an electric coffee maker so I made my coffee in the espresso maker and realized that it made a fabulous cup ! Years later I found it in NYC and haven’t gone back since… I like my coffee extremely hot and I can get that from this contraption. Even the milk gets warmed and mixed with the freshly brewed coffee in the top compartment. I then pour my coffee into an insulated hand blown 10 oz cup that I absolutely love. I now travel with it where ever I go, I even take my ground coffee. I know it sounds a little nutty but you can’t diminish the satisfaction of a superbly brewed cup of coffee. I would love to know what you use to make your morning cup of coffee and why you love it so much! While I was working on this post, I started to wonder who discovered coffee?? It is such an important part of my life- I had to know. I sort of had an idea that it started in Ethiopia and spread from there but didn’t know that it started as early as the 10th century! What an old tradition it is- when I started thinking how many conversations I have had over a cup of joe- it’s no wonder people love to gather over coffee! For me it’s the first thing I think of in the morning and the last thing I look forward to before I go to sleep. 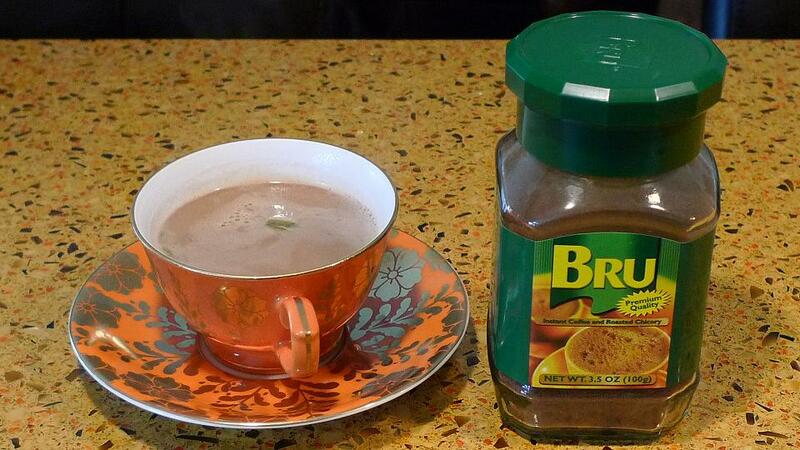 I don’t need to have my it as soon as I wake up- I like to savor it, sit down, relax and enjoy the delicious cup. I get breakfast ready for my daughter and take her to school in the morning- I then come home and make my coffee and breakfast. The whole time I am going through the morning mundane rituals, all I can think about is sitting down by myself and enjoying my big cup of goodness! I usually stick to one cup a day- once in a while- okay a few times a week, I indulge in a second cup.- it usually is a cup of cappuccino. I still dream of that perfect cup of cappuccino I had in Italy years ago and can’t wait to replicate that experience this summer when we go to Umbria! What would life be without the pleasures of good food and drink!! 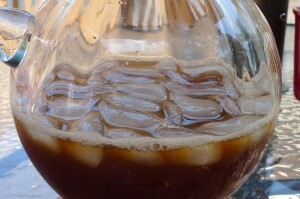 Try making this kind of coffee- it is a nice change of pace or a great addition to your daily repertoire. I bet it would be delicious chilled as well now that warm weather is upon us- I will try it and report back!